A recent report by Transparency Market Research on the substance abuse treatment market in the U.S. states that the competitive landscape is highly fragmented. This is because around 242 companies compete against one another in it. This also makes overall competition stiff. Some of the companies that have beat competition to emerge as leading players in the market are Pfizer Inc., Alkermes Plc, GlaxoSmithKline Plc., and Purdue Pharma LP. Their astute marketing strategies have helped to enhance their market shares majorly. 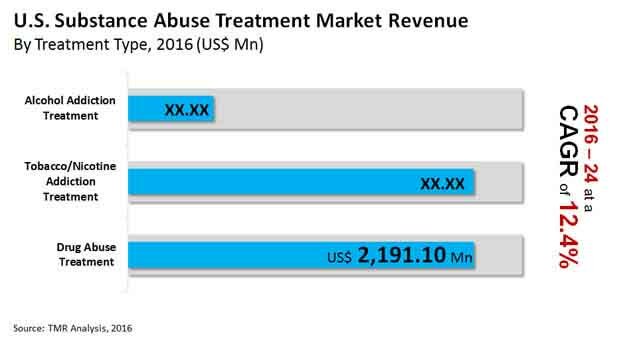 Our report, which valued the U.S. market for substance abuse treatment at US$4.42 bn in 2015, estimates it to become worth US$12.43 bn by 2024-end by rising at an impressive 12.40% CAGR between 2016 and 2024. The most prevalent substance abuse in the U.S. are those pertaining to tobacco or nicotine addiction, alcohol dependence, and opioid addiction. Among them, the tobacco or nicotine addiction leads owing to around 15.0% of people in the nation being addicted to smoking. When it comes to end users, the outpatient treatment centers are responsible for driving most of the demand mainly because their rising popularity. In the years ahead too, the segment will drive most of the demand in the market. At the forefront of driving the market for substance abuse treatment in the U.S. is the spike in number of alcohol, opioid, and nicotine or tobacco addicts. “The federal government along with the local authorities in the nation have devised myriad early intervention and therapeutic strategies to bring the situation under control. This is expected to bode well for the market for substance abuse treatment in the near term,” states the lead analyst of TMR. In addition, the U.S. market for substance abuse is also expected to gain from the leading companies’ efforts to enhance their customer base by generating awareness through campaigns about the harmful effects of drug abuse and the necessity of timely treatment. In order to do so, the companies are seen banking upon every medium including print, television, and online. On the flipside, not too many therapies for mental illness resulting from substance addiction and stringent rules pertaining to approval of therapies is dampening market growth to an extent. The most widely sold drugs in the market for substance abuse treatment market are disulfiram, naltrexone, and acamprosate. Among them, acamprosate will likely see maximum share in the near future. Non-nicotine medications and nicotine replacement treatment have now emerged as the most effective treatments for nicotine and tobacco addiction.